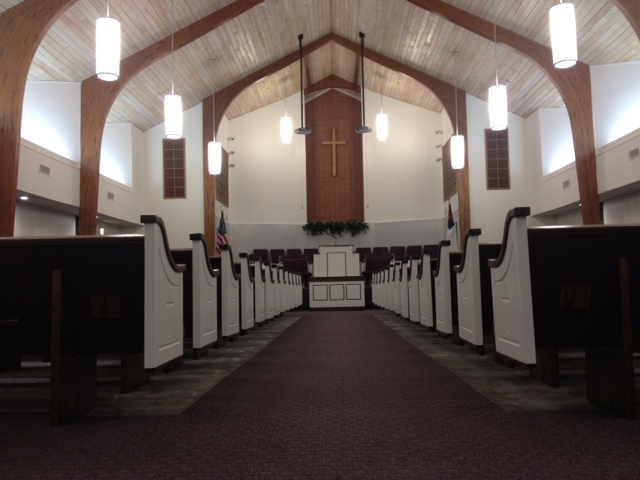 We recently finished a tricky installation at the First Baptist of Alto, Texas. We built the pews, pulpit, and communion table and brought them to Alto just in time to install all of them before their big open house the next day. After thirteen straight hours of work, we finished the installation and left the First Baptist Church ready for their big debut with beautiful brand new church pews. Along the El Camino Real, also known as the Old San Antonio Road, is the small town of Alto, Texas. Alto is the closet municipality to the Caddo Mounds State Historical Site, an archeological site from the Caddoan Mississippian culture, and is named for being a high point along the ridge between then Neches and Angelina Rivers. El Camino Real travels from Natchitoches, in Louisiana, to San Antonio and then on to the Mexican border. Parts of the trail were in use before Europeans came to North America and the rest was eventually blazed by explorers. Alto is steeped in American history and the First Baptist Church’s architecture reflects the community’s connection with the past as well as its relevance today. Alto’s First Baptist Church looks like a conventionally modest church on the outside but is instantly impressive once visitors enter the sanctuary. The exposed beams resemble Noah’s Ark and give congregation members a sense Christian tradition. 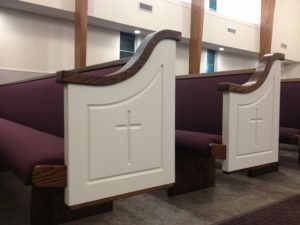 It’s only fitting that the pews we installed in Alto’s First Baptist have both traditional and contemporary elements. First Baptist has some very modern and contemporary aspects to its architecture, including the sweeping exposed wooden beams and windows that let in light well above the seating area. One of the highlights of this church design is the vaulted ceiling with its beautiful woodwork, and we wanted church pews that helped focus on this aspect of the church. The cantilevered style of the church pew ends creates an open feeling in the aisles that echoes the tall, elaborate ceiling of the church. The white walls between the wooden beams inspired the white-painted pew ends. The white paint also lends itself to a more traditional look and adds to the sense of history in the church decor. In addition to the church pews, we also installed a custom pulpit and communion table, built specifically to match the church furniture and give a solid foundation to the altar. 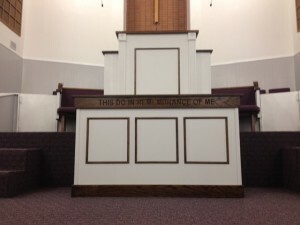 The pulpit and communion table both have large footprints and are attention grabbing, helping to center attention on the altar when someone is speaking. 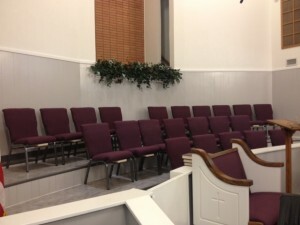 We can help your church get a completely new look just in time for a special event as we did for Alto’s First Baptist Church so be sure to call us for a free quote if you’re looking for church pews on a budget and tight timeline.